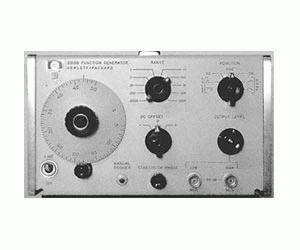 The Agilent 3310B Function Generator is a compact, easy-to-use, reliable function generator with output waveforms consisting of sinusoidal (0.0005Hz to 50kHz), square, triangle, positive pulse, negative pulse, positive ramp, and negative ramp. Voltage-controlled, 10 decades of range. The Agilent 3310B has all the features of the standard 3310A plus single and multiple cycle output capability. Start/Stop Phase can be adjusted over a range of approximately ±90º. A fast rise time sync output is also provided. Adjustable DC Offset amplitude of ±10 V open circuit (±5 V into 50-ohms).